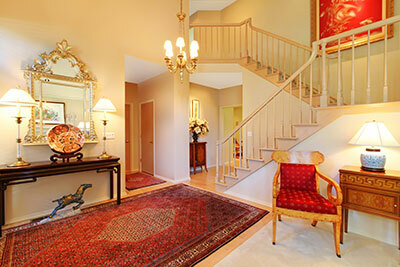 At Palm Beach Oriental Rug Cleaning Pros, we clean all rug types in North Palm Beach, FL. Some of the types we clean are: area rugs, oriental rugs, tufted wool rugs, flat-weaves, synthetic, sisal and jute—just to name a few. We even clean the rugs most other rug washers won't touch. If you've been told that your rug cannot be cleaned because it is a "bleeder" (this means the dyes will "bleed" when cleaned) then you've found the right company. We have the experience and knowledge to clean any rug even the "bleeders." Area rug cleaning is a highly technical process that can only be properly and safely accomplished by trained and experienced rug washers. It's completely different than any carpet cleaning method you've ever seen. A thorough rug inspection is an absolute must before we touch your rug. We will identity the type of rug, size and any issues that need special attention. 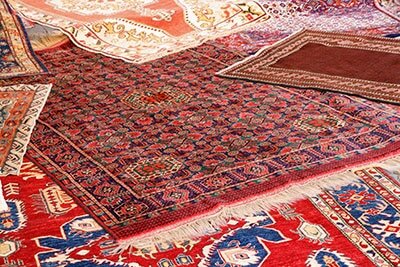 Most damages to rug can be corrected through rug cleaning or rug repairing. Next, we’ll perform dye stability testing. Dye testing is the step in the process where we identify potential dyes that can come loose from the fiber; this is known as dye bleeding. Our dye testing process helps identify rugs that have unstable dyes. Once identified, proper steps can be taken to help lock dyes in place as well as hold loose dyes in suspension during the cleaning process. Because of the naturally dull appearance of wool, area rugs hide soil well. An 8x10 rug can hold several pounds of dirt in its fibers and foundation. Simply put, maintenance can be overlooked because the rug does not appear soiled. The rug is first thoroughly vacuumed front and back with a hepa vacuum. We then use a professional grade rug duster that will gently vibrate all dry dirt, allergens and grit from the fiber content and foundation. After dusting, we then vacuum the rug again. At Palm Beach Oriental Rug Cleaning Pros, we combine old cleaning methods used for centuries with modern day equipment and wool-safe products. Many experts in the rug cleaning industry refer to this cleaning method as 'river washing.' Woven rugs are cleaned and agitated with wool-safe products, and then rinsed with pH neutral, soft water. Fiber content and level of soiling will determine the method of cleaning. Rugs are cleaned with wool-safe rug shampoo, maximizing clean-ability and protecting the fibers of the rug. Because wool is very absorbent, it allows rug makers to manufacture bright beautiful rugs because dyes will adhere more easily than synthetic fibers. The drawback is that it's easily stained because of its absorbency. Spotting stains can be done before and after the rug wash process. We use wool-safe spotting cleaners that will not remove dyes from the fibers. Wool is a fantastic fiber to hide soiling. It has many layers of cuticles that can hide the dirt and grit making it visually harder to detect soiling. Just because a rug does not appear dirty does not mean it's clean. Our team goes the extra mile on every rug to ensure maximum cleaning.